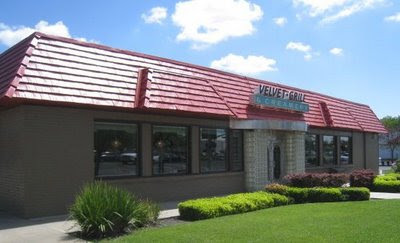 Velvet Grill & Creamery in Modesto, CA is a friendly, cozy place for a burger. Make sure you get the sweet potato fries. I wasn’t going to and the server brought them anyway. It was a fine treat. In the middle of the tree-lined streets of Modesto, the Velvet, sits invitingly. I wandered in through the glass block entrance at noon on a Saturday. The place was about half full. I was greeted warmly and led across the carpeted floor to a teal-colored corner booth. I had a nice view of the Breakfast At Tiffany’s poster and the other memorabilia on the wall. 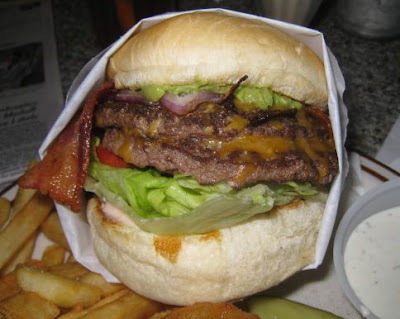 At the suggestion of my server, I ordered the avocado & bacon cheddar burger with fries ($8.99). They were also nice enough to put some onion rings on there for me. The rings are normally $5.99 by themselves. 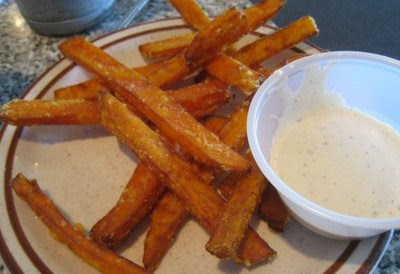 She tried to convince me to take the sweet potato fries, but I wanted to review the regular fries as I always do. I also ordered a Chocolate Shake ($4.25) from their extensive dessert menu. In my experience, any place with “Creamery” in the name usually has a good shake. No exception here. It came in a parfait glass with whip cream. It was cold, creamy and smooth. The chocolate even seemed to have a faint hint of fruit. The burger came extremely quickly. It was an impressive stack of patty, cheddar, grilled red onion, bacon, lettuce, tomato and smashed avocado on a pillow of white toasted bun. Everything was wrapped tightly in white paper to hold it together. The fries and onion rings were crowded onto the plate with ranch dressing. The burger was very tasty, I think I would put a little less avocado on it as it overwhelmed everything else a little. The bacon was thick and firm without being chewy. The burger patty itself was tasty like I used to get at the Penguin Point drive in back in Indiana. The fries were forgettable medium thick and nothing special. The onion rings fared better. They were battered and crisp and tasted good dunked in the ranch. About the time I was regretting not getting the sweet potato fries, the server brought me a plate. “I think you should try these.” She said. They were really tasty. Cut very thin about the size of a wide noodle, maybe 1/8 inch by 1/2 inch. They were crisp and did not sag when you picked them up – not even the ones that were four inches long. They were sweet, but a little spicy. The chipotle ranch dressing was a perfect compliment. I ate the whole plate, never looking at the potato fries again. I felt right at home at the Velvet Grill & Creamery. Next time I am in Modesto, I am going in the morning. The breakfast menu looked very good. The food for the most part is decent. I enjoy their sandwiches and fries. Their prices are reasonable also.